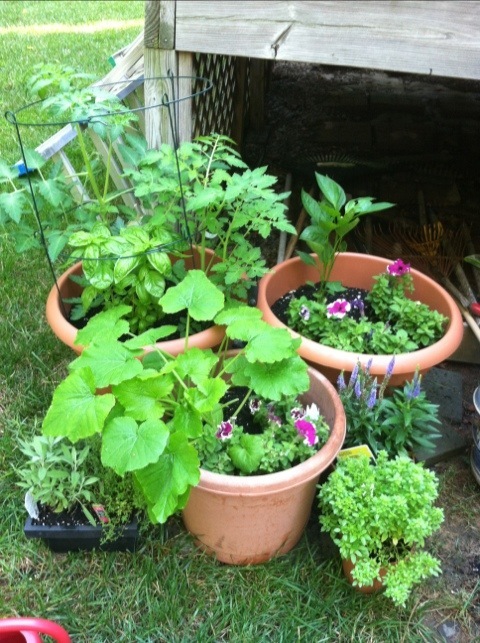 The container garden is flourishing! Seriously. Look at that zucchini plant! And the tomato plants have really put on some height and additional stems. 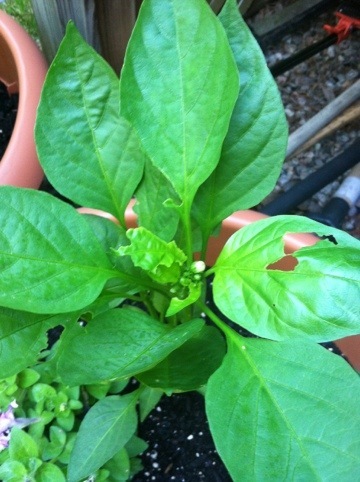 There are even buds on the pepper plant despite what looks like a pest problem. I picked up some organic insecticidal soap to help with that. Hopefully, I’ll see an improvement this week. The basil I screaming for me to use it all up, but the whole family has recently started the South Beach Diet so my intense urges to make pasta and smother it in fresh basil and olive oil will have to wait two more weeks. I think I’ll shoot for pesto instead. I’ve seen recipes that sub broccoli and other heartier goods for the pine nuts (nut allergy here) so we’ll see what I can come up with. And to my great surprise, my cilantro (or spinach if I am not remembering correctly) has sprouted a week after I gave up hope! Eva continues to want to water the garden zealously… Tough to explain that all the rain we’ve had in the past few days means we don’t need to, but the grass in the yard probably appreciates her efforts. Her joy in this endeavor is just so beautiful. Let’s just hope she doesn’t pick all the tomato flowers for a bouquet! 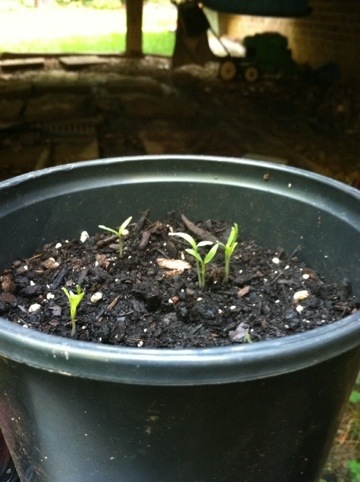 This entry was posted in Family, Gardening and tagged Activities with Kids, Gardening, Green, Sustainable Living by abbyandeva. Bookmark the permalink. That’s awesome! I love hearing about kids getting into gardening and that kind of stuff. 🙂 Also, does the South Beach Diet really work? Yours look far better that mine! I don’t even see even a little green trying to come out…I tell ya, I just don’t have the “thumb”:) Blessings…. Like I said, I’d given up on my seedlings, my transplants were doing much better, so I was shocked when I saw those little sprouts this morning! Maybe your “thumb” just needs a little encouragement? 🙂 I have been loving my gardening books that accompanied the gift! “Little House in the Suburbs” is awesome.